Decadent. Maple-y. Vanilla-y. Delicious. GET IN YOUR BELLY! 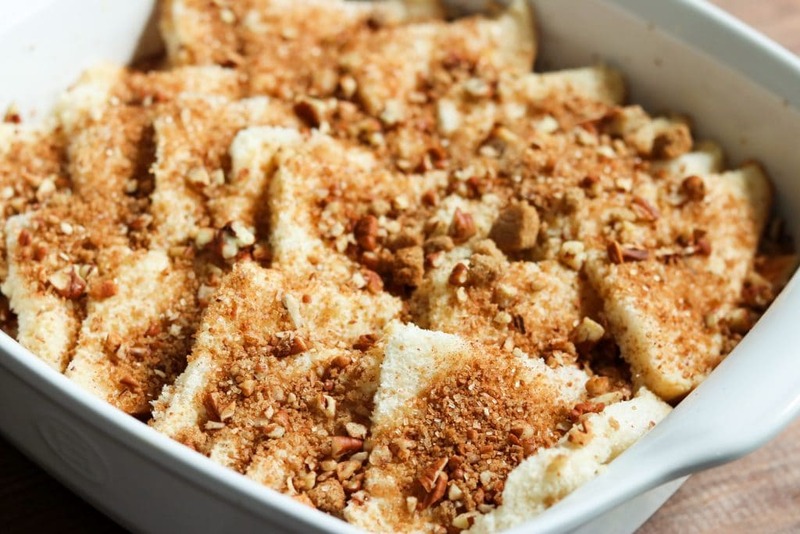 This gorgeous Baked French Toast recipe is the real deal. Delightfully flavored french toast, topped with a sweet/nutty/crunchy topping, be warned – you will get addicted!! Okay, you’re going to need to make this. Since the first time I made it, experimenting with different flavored maple syrups to use – now, any time I say “what shall we eat for breakfast?” I get a resounding “BAKED FRENCH TOAST” in response. I mean, I’m also saying it – but the husband and kids are super loud about it. If you’re not already sold on this idea, how about this? You can make this ahead, let it hang in the fridge overnight – and pop it in the oven the next morning. Ta-Da! Breakfast is served!! This little guy (a willing model – the very patient, very eager-to-eat-but-will-let-me-take-pics-if-it-means-he-gets-to-chow-down, H) is a HUGE fan and begins his campaign for baked french toast on a Friday night. Begging me to make it ahead so he can enjoy a Saturday breakfast. Grease an 8×8 baking pan with butter or baking spray. 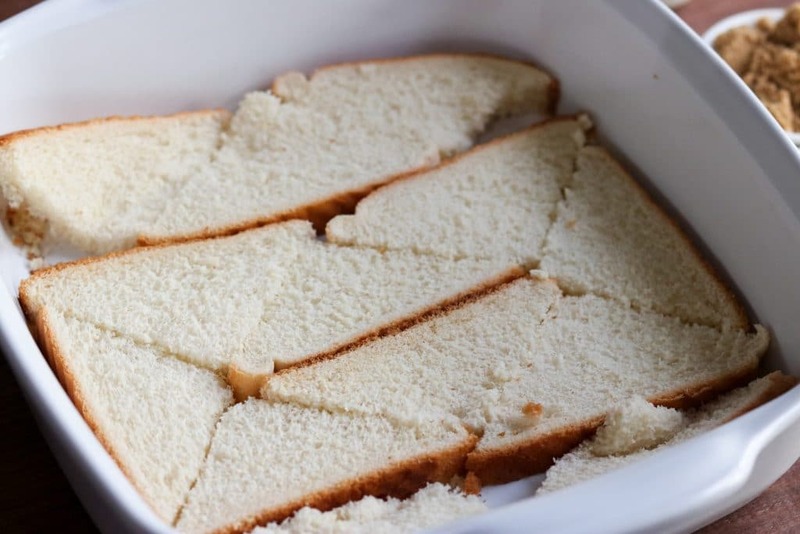 Cut the bread into triangles, and arrange in the baking pan. In a measuring jug, whisk together the eggs, half and half, maple syrup and salt. Cover, and refrigerate for 30 minutes or overnight. 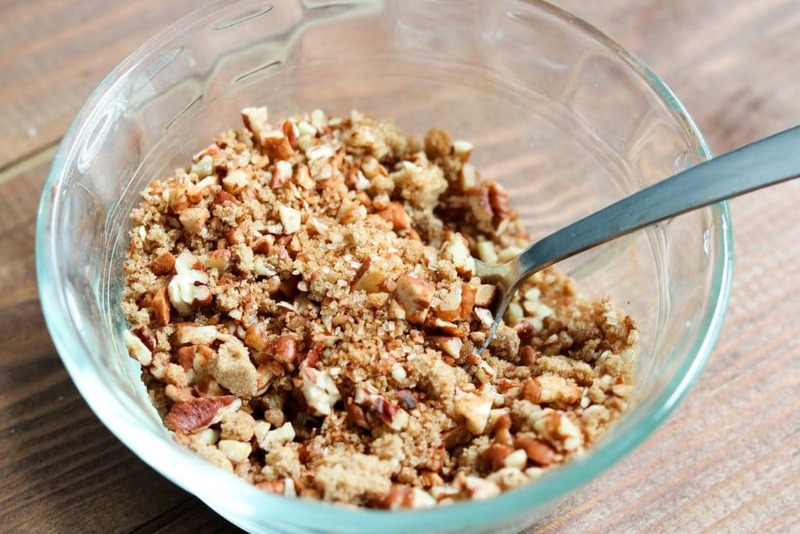 In a small bowl, combine the brown sugar, pecans, cinnamon and salt. Sprinkle topping over the bread. Bake for 30-40 minutes, or until golden brown on the top and set. 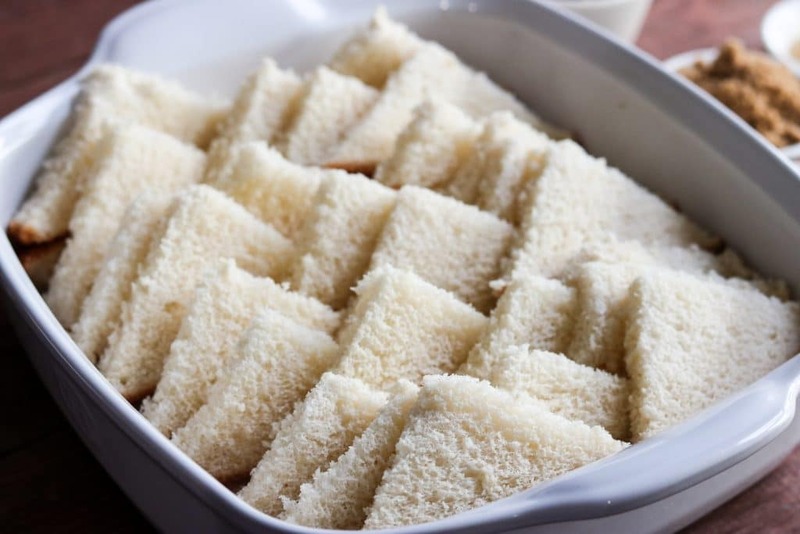 Switch out the white bread for whole wheat! 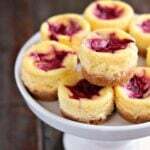 For some more great breakfast recipes, try these!! 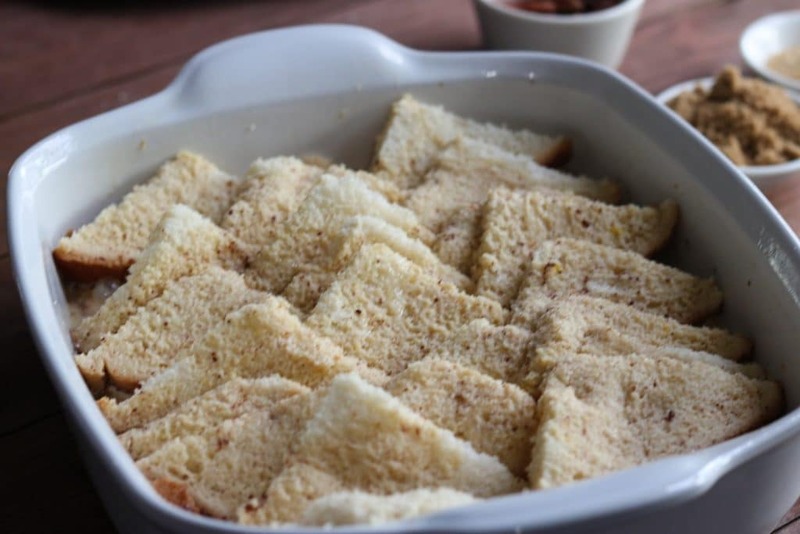 WANT TO TRY THIS BAKED FRENCH TOAST? PIN IT TO YOUR BREAKFAST BOARD! Decadent. Maple-y. Vanilla-y. Delicious. GET IN YOUR BELLY! 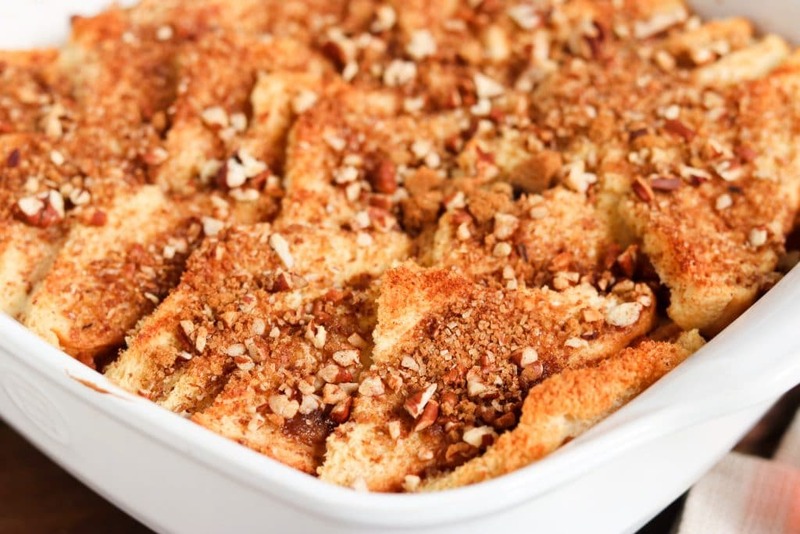 This gorgeous Baked French Toast recipe is the real deal. Delightfully flavored french toast, topped with a sweet/nutty/crunchy topping, be warned - you will get addicted!! Grease an 8x8 baking pan with butter or baking spray. Update: This post was originally posted in May of 2018 and has been updated to improve the reader experience. The recipe remains the same! My oldest has been asking for French toast almost every morning! Let him have it, Kate! 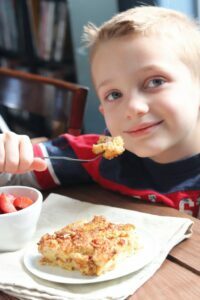 Certainly looks like your adorable son is enjoying the French toast! I know I would! Awesome recipe to go with these amazing syrups! so this is how I get my boyfriend out of bed. So much tastier than yelling! This sounds awesome! 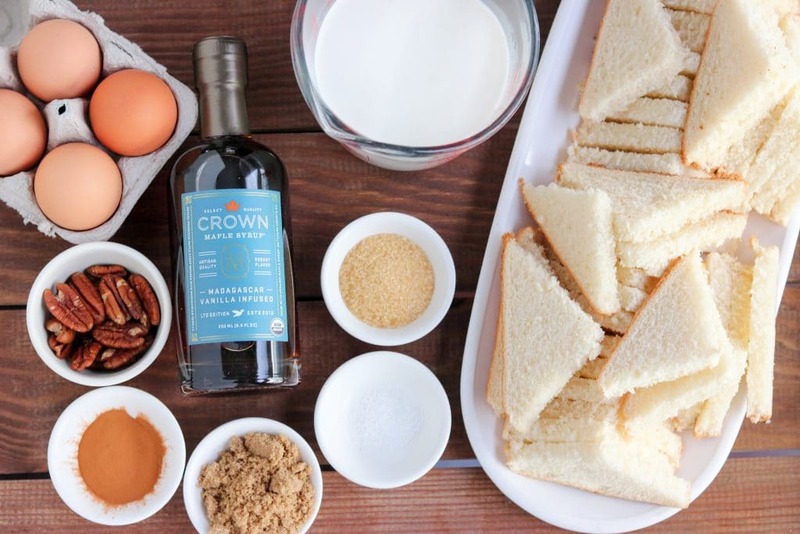 I love maple syrup – I totally have to try this kind. Cannot resist ! Thank you ! 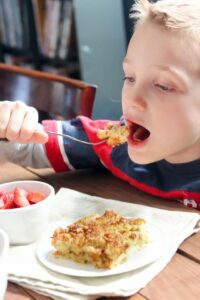 my son really loves baked french toast and I like your version very much. 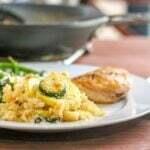 He is spending some time visiting this week and I am going to surprise him with this recipe thank you very much I am sure he will love it! I have to admit, my french toast never seems to turn out when I make it in a pan on the stove top. I love that this recipe is more of a casserole style. I think this is the way I need to go! Thanks for the amazing recipe! My kids love French toast, who wouldn’t right? This looks so perfect. I love the combination of Maple with brown sugar. Such a wonderful flavor. I bet the kids enjoyed this, mine sure would. We love french toast and can see this as a perfect Mother’s Day brunch. 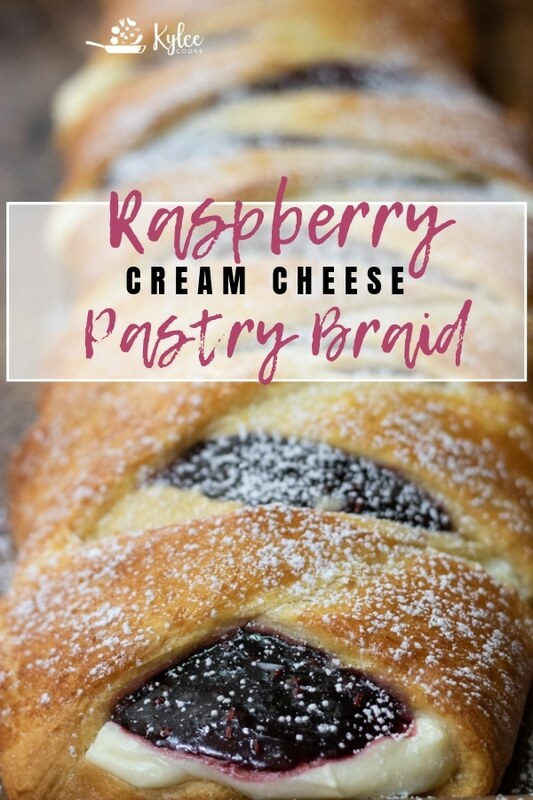 It’s always a struggle for me to think of creative breakfast meals for during the week but this looks delicious and easy! French toast is such a wonderful meal, and the vanilla infused maple syrup sounds out of this world! Thanks for the fun facts as well! I feel like I need to have a gallon of that syrup! 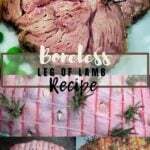 What an awesome recipe .. I love french toast and kicking it up a notch with the maple and vanilla definitely makes this a Sunday morning must-have! Now! Beautifully baked bread with that delicious topping, looks way too gorgeous ❤️ I love the idea of making it Saturday night and magical breakfast on Sunday morning, love it! When I used to make French Toast for my kids I always saved me one or two slices. But your recipe sounds so much better than what I used to make. I’m saving your recipe for when the grandsons come over. I am obsessed with this maple syrup! I need to give this french toast a try for Sunday brunch! Made this for a beginning of the school year teachers’ breakfast and it was gone before I could try a serving. However, I did find a spoonful left and tried it for the first time. It was marvelous. Certainly a “keeper”. Thanks so much for sharing. I really need to make this more often – I love it so much too! !